Protects your sprocket from scraping the ground, or anything else. Keep those sprocket teeth intact! As low as $27.95 when ordering 6 or more! 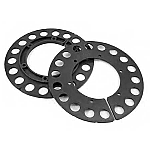 #35 split sprockets with available teeth count ranging from 54 to 85! Fine tune your torque and top speed with a variety of #35 Split Sprockets. #219 single sprockets. Fine tune your torque and top speed with a variety of sprocket sizes. Righetti Ridolfi Extron #219 plastic rear sprocket for racing karts.